How effective is FUE into the scar? I shave my sides to a #4 but if I go any lower people start asking questions. I want to be able to shave to a #3. Should I consider FUE into the scar? Any associated risks such as shock loss or making the situation worse? I have seen cases where an improvement has been made, but the grafts are being transplanted into scar tissue, so the yield may not be as high. 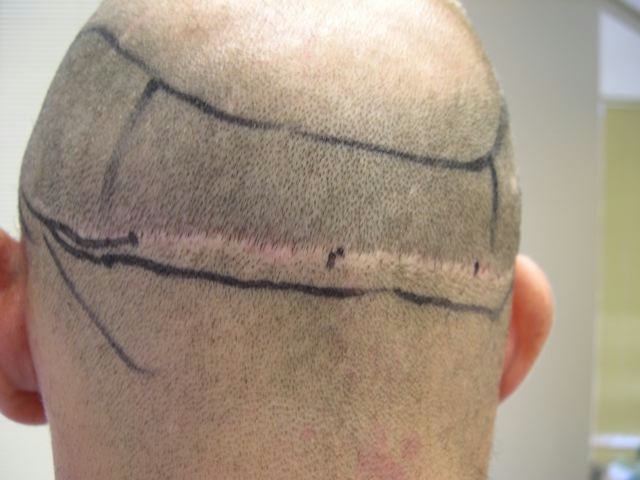 Many patients prefer a scar revision done by a plastic surgeon, but scars can be repaired with FUE. It is not possible to know how high the yield will be, if it’s high a second FUE surgery can be performed, filling the scar area to good density. 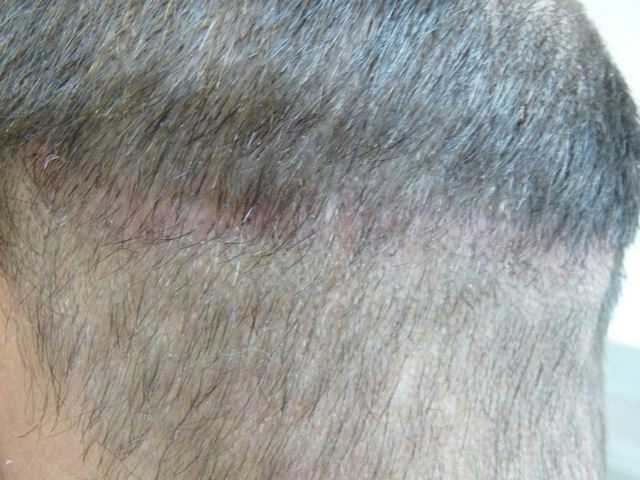 This is a good scar repair case, the patient opted for a FUE instead of scar revision. How can you possibly say that is a good scar repair case via fue through your clinic if there are no results shown??? For all we know not a single graft grew. All we see is grafts placed into the scar. So grafts placed into a scar automatically makes your results “a good scar repair case”??? Sounds pretty shady to me. Are you able to take a picture of your scar? It helps if you could upload a picture. Here are some FUE scar repair photos. Dr. Jones’ patient. 1000 BODY HAIR grafts into Strip scars. Video showing FUE into strip scar results. Dr. Umar’s patient. BEARD hair as donor. Two things were working against this guy: beard hair, and grafts into a scar. Yet the results came out phenominal. This was an awsome result by dr Umar. Really good to see the doc pushing body and beard fue forward. 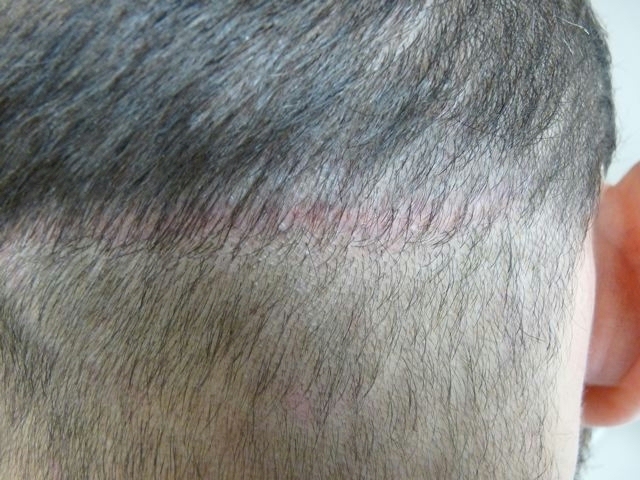 The following pictures are an example of strip scar repair via CIT. The results are after one procedure of 80 grafts. The results shown are at 8 months and 2 years post-op, respectively. It’s important to note that strip scars will often require more than one session and the growth can be unpredictable. 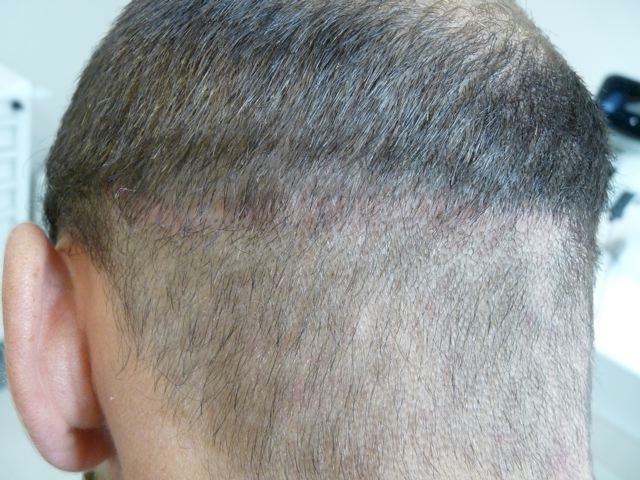 However, in successful cases like the one shown, the patient can have restored confidence in wearing his hair short. 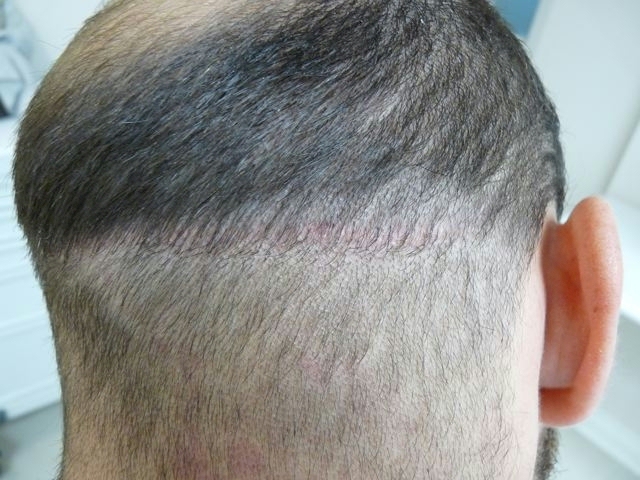 You can see some more pictures of Dr. Cole’s scar repair work on his website (look under scar grafting). pretty good, but the shave in the first picture looks like a zero guard while the post op looks like it’s grown out a little bit. Not a good comparison. any doctor advising strip does not have your best interest in mind. » can be repaired with FUE. what is scar revision? is this something your clinic offers or a common procedure done by plastic surgeons? You better believe it, both the video and the pictures just below it are ridiculous, in the ‘After’ shots the hair is a totally different length !!! I think the truth is that beard hair into a Strip scar can sometimes help a lot but if you are expecting the scar to be undetectable you might be in for a very rude awakening. N.B. 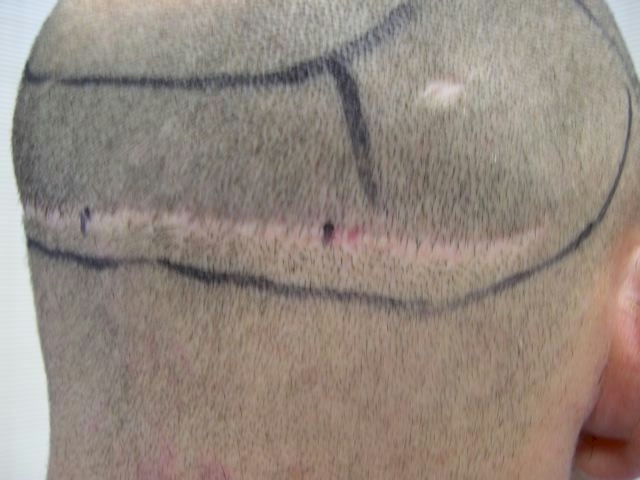 A scar revison is where they cut the Strip scar out and suture it up again hoping to create a smaller scar. Sometimes works well and sometimes it doesn’t - it depends on a lot of variables - a person should consult with a reputable doctor about this.